Think you can't afford the RV of your dreams? Think again! Here at TerryTown RV, we have a huge selection of travel trailers, 5th wheels, and more at some of the lowest prices in the country! 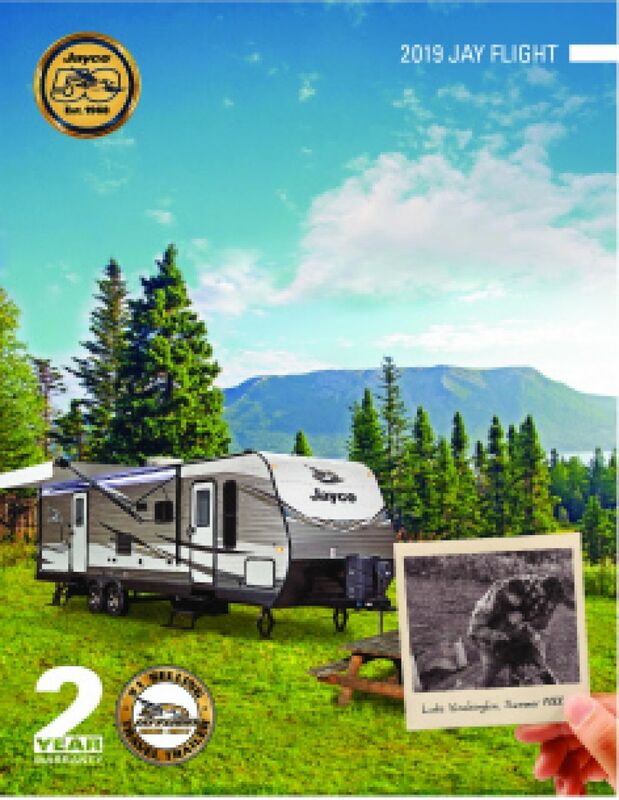 So if you're in love with the 2019 Jayco Jay Flight 32BHDS Travel Trailer, we can make owning it a reality. As a top dealer in Michigan, we have super low rates and no money down financing! We'll make owning your dream Travel Trailer easier to afford than you ever thought possible! Stop in and see us today! We're conveniently located at 7145 Division Ave S Grand Rapids Michigan 49548 and we're ready to give you the best buying experience you could ever imagine. Don't live in Grand Rapids? Don't worry! Give us a call at 616-455-5590 and ask about our 24/7 store to door delivery service across North America! We have satisfied customers throughout Michigan and the country! Don't wait another day to make your RV dream come true! This Travel Trailer is ready to hit the road when you are! It's 36' 2" long, 8' 0" wide, with a hitch weight of 845 lbs. The 18' 0" patio awning provides shade and UV protection for outdoor relaxing! And with a GVWR of 9995 lbs, this rig is built to give you years of outdoor fun! 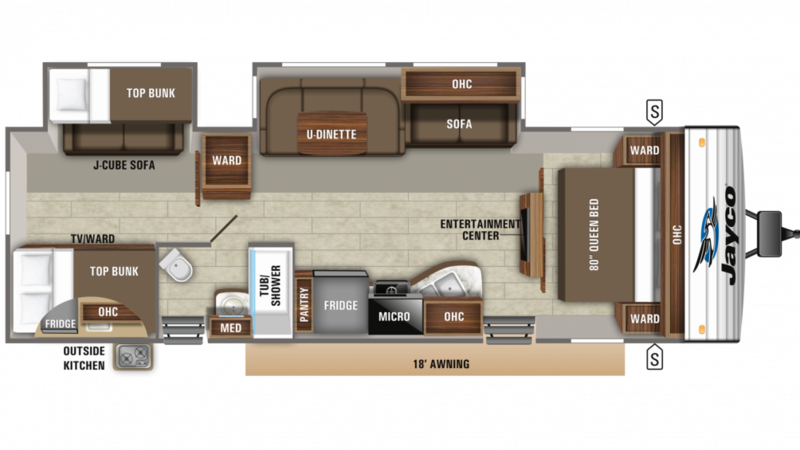 By expanding out the 2 slides, you'll enjoy increased spaciousness inside this 8' 0" wide, 36' 2" long RV! With a height of 11' 2", you won't have to worry about constantly hitting your head! The interior stays nice and temperature controlled with the 35000 BTU furnace and the 13500 BTU a/c! Nothing feels like home more than sleeping in a spacious, comfortable bedroom! The 2019 Jayco Jay Flight 32BHDS has a handsomely furnished, main bedroom with a regal and cozy Queen bed! With all of the snug sleeping accommodations throughout this camper, up to 8 people can sleep well at night! Skip the hassle and inconvenience of the campground community bathroom with this Jayco Jay Flight. It has a bathroom and 80 gallons of fresh water for showers, shaves, and wash ups! Plus, the Porcelain Foot Flush toilet is handy, convenient, and sanitary. The 39 gallon black water tank and 33 gallon gray water tank can accommodate the whole family's needs! When it's time to hit the hay, you don't have to throw together some makeshift sleeping space for your kids in this RV. The roomy bunkhouse with its comfy Bunkbeds will be the favorite choice of your young ones, depend on it! When you want to host a cookout, you'll have the perfect way to do it thanks to the handy outdoor kitchen in this RV! It opens easily, and you'll cook up great tasting meals for the family or guests in no time, all with that great outdoor taste!